Diameter, 50 mm. Thickness, 23.5 mm. Overall dimensions, 63 mm. Case back attached by 4 screws for rapid access to the movement for adjustment purposes. Three-level dial with SuperLuminova and date indicator at 9 o’clock. Water resistance: 10 ATM 100 metres. 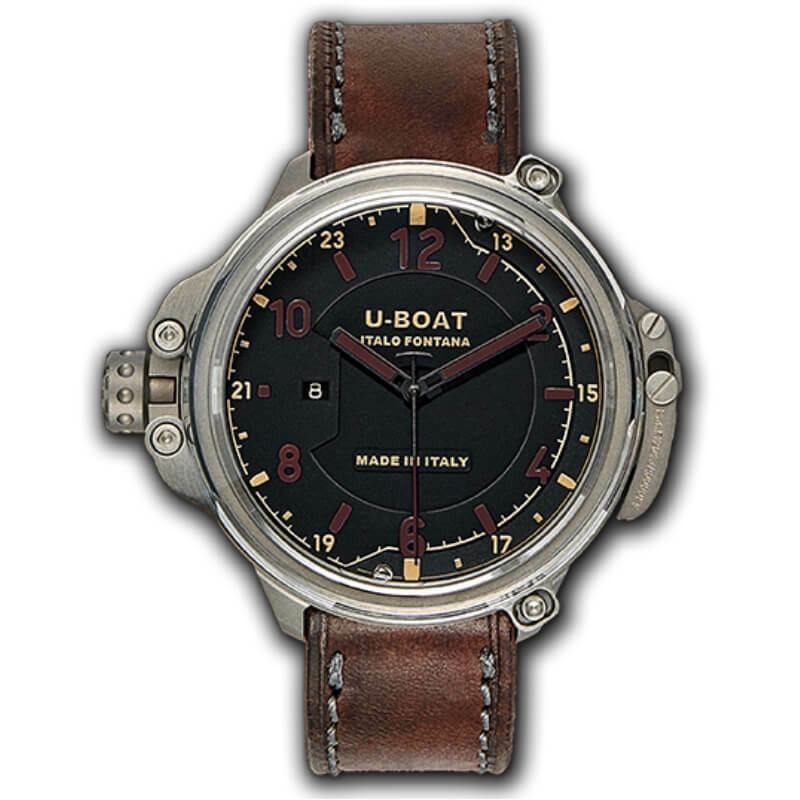 Strap made from leather selected and treated according to U-Boat specifications and aged naturally without technical forcing. Fully hand worked waxed cotton finishing with laser engraved.Tongue buckle. Two-piece case (middle and back) is joined by screws and has no bezel, which is replaced by the glass itself; made from titanium grade 5. Special titanium screw crown positioned at 9 o’clock, designed and manufactured according to U-BOAT technical specifications. The release mechanism on the right side of the case provides easy access to the dial and component parts. A special titanium ring guarantees an airtight seal and total water resistance. The ring is also fixed in place with 2 screws on the lugs for greater resilience and security. Titanium screw crown made to an exclusive U-Boat design.